CBE-162: Battery Eliminator for Standard HT radios such as C168A, C468A, C178A, C568A, etc. Enables high-watt operation of HT radio from a 12VDC socket! CBE-600 : Battery eliminator for ADI-HT-600, AT-600, and REALISTIC HTX-204 radios. 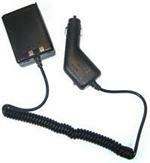 Plugs into 12-13.8VDC socket; has coiled cord; other end slides onto bottom of radio. Has built-in Voltage & Amp limiting, and noise filtering. CBE-152 : Battery Eliminator for STANDARD, ADI, JRC, Heath, and Relm radios. The CBE-152 is a battery eliminator for STANDARD-ADI-JRC radios such as C228A, C528A, C628A, C558, HX190, HX240; ADI AT200, AT201, AT400, AT401; JRC JHP-500, JHP-520; SENDER 145, 450. Provides instant Hi-Watt power to the HT from a 12V DC socket!